This is the second incarnation of the name Terrace House - the original was further down the High Street and is now called Godolphin House - No.115 High Street. Originally No.125 High Street was known as No.5 the Terrace. 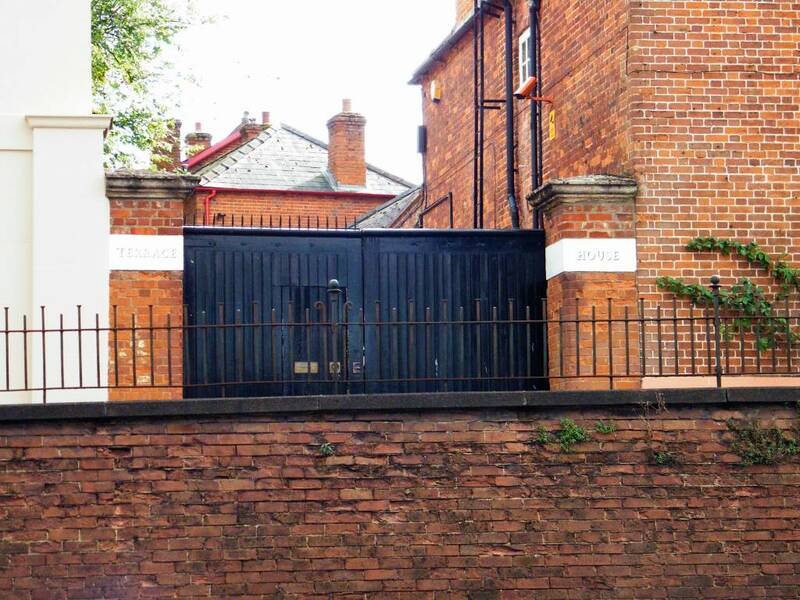 Before retiring and moving to the Terrace Thomas Stephenson had been a racehorse trainer on the other side of the road at Clarendon House Stables - No.194 High Street and can be seen there on the 1861 - 1881 censuses. Thomas died on 19th September 1897. 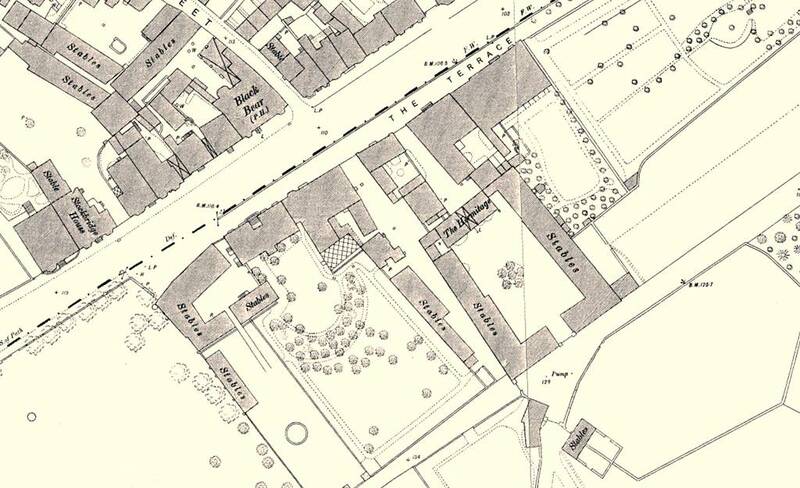 As can be seen in the 1885 map below the land at the rear that was to become Terrace House Yard was at that time part of the garden of Richmond House - No.127 High Street. On the 1884 sales details of when William Parr Isaacson (from Willoughby House - No.103 High Street) sold-off what had been Crockford's and before that Panton's Estate, although right next-door to the estate these houses were not part of that land. No.5 the Terrace is not marked on the map of the estate, but the land belonging to Richmond House is shown as belonging to Mrs. Rogers. 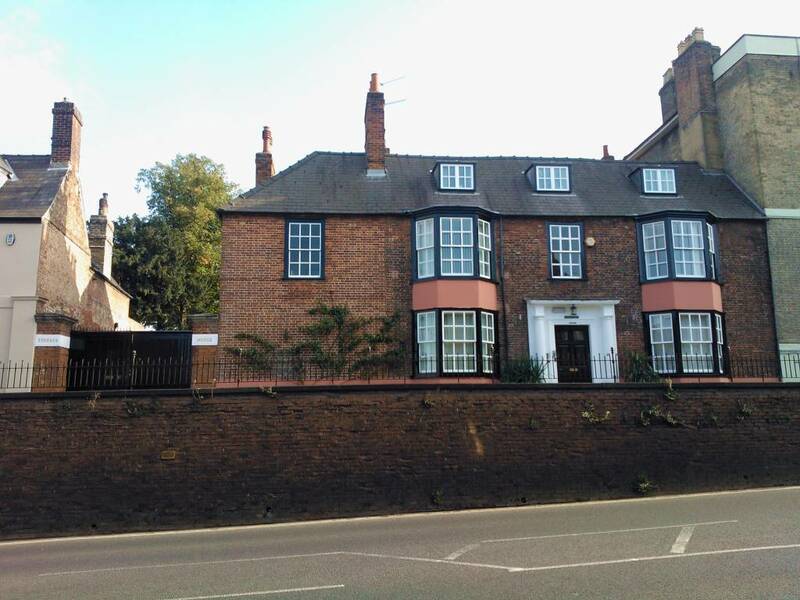 The first occupier to name this address Terrace House was trainer & veterinary surgeon Frederick William Day. Frederick Day took over the house in 1899 and added the extra bay window in July 1900, but he was still living in Lowther House - No.146 High Street on the 1901 census. Although Fred's son Reg started training in the stables here in 1900, the Day family aren't shown as living here until the 1911 census. 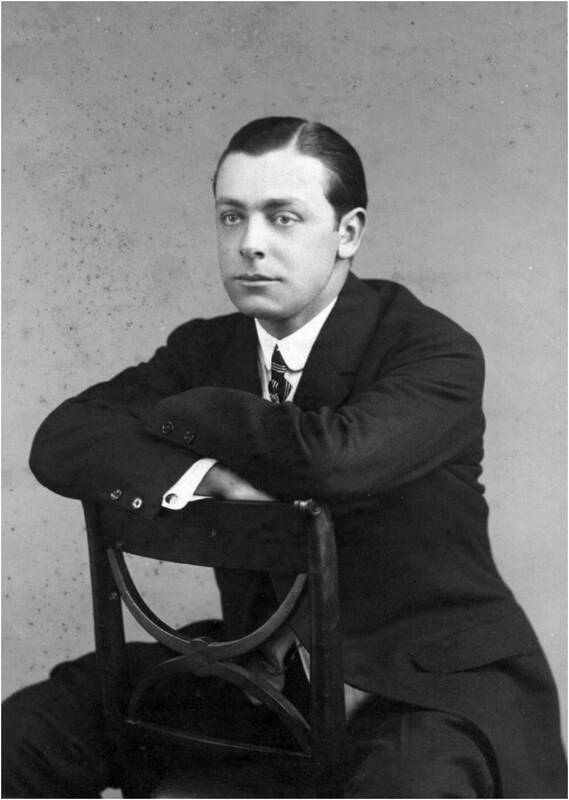 Frederick (Fred) William Day was the son of William Day and Mary Carloss Peart, he was born in Fiddington, Gloucestershire on 21st December 1854. He qualified as a veterinary surgeon in 1878 and in 1881 was living and working as such in Victoria Cottage, East Street, Tewkesbury, with his younger sister Rosa Mary Day. The marriage of Frederic William Day, aged 27, bachelor, veterinary surgeon, of Tewkesbury, Gloucestershire, son of William Day, farmer, and Emma Roberts, aged 29, spinster, of Winchcombe, Gloucestershire, daughter of James Roberts, farmer, was solemnised at St. Peter's Church, Winchcombe, Gloucestershire, on the 25th of April 1882. The ceremony was conducted by the Revd. Robert Noble Jackson, M.A., Vicar. The witnesses were William H. Roberts and Julia A. Roberts. As detailed above, a year later he married Emma Roberts on 25th April 1882. At this time Willesden and the nearby area were very important in the formative history of racehorse husbandry and welfare - Edmund Tattersall (of Tattersalls fame) built a model stud farm at Willesden Paddocks. There were many other stud farms and stables at Willesden Green, Church End and Neasden and Fred moved to Neasden Stud Farm, where Reginald was born 20th February 1883. Fred caught the attention of Lord Carrington, who had just been appointed Governor-General of Australia (12th December 1885). He invited Fred to go with him there, setting up as a veterinary surgeon at Randwick, the Newmarket of Australia. It was while he was here that Fred also started training horses, with immediate success. He won scores of races, among them the coveted Sydney Cup. After a few years living in Australia the family returned to England in 1894, firstly to Cheltenham, Gloucestershire, then finally back to Newmarket, living at Briarwood (does anyone know where that was? - please E-MAIL me). Sir Ernest Cassel who was living at Grafton House - No.144 High Street at that time, set up Fred as the trainer at his stables at Moulton Paddocks. Sadly Emma died on 28th March 1897 and left Fred with six young children. Day. - March 28, at Briarwood, Newmarket St. Mary's, Emma, wife of Frederick Day, veterinary surgeon, aged 44 years. We regret to record the death of Mrs Day, wife of Mr Frederick Day, veterinary surgeon, which sad event took place suddenly on Sunday last. [The Grave Stone in Newmarket Cemetery is inscribed: 'Emma, Dearly Beloved Wife of Frederic William Day, who Died March 28th 1897, Aged 44 Years - Thy Will Be Done - Also Frederic William Day, who Died March 11th 1919, Aged 64 Years - Peace, Perfect Peace']. On January 12th 1898 Fred remarried to widow Jane Aldcroft (nee Cartwright) - details about her can be seen on the page for Lowther House - No.146 High Street, where they can both be seen living on the 1901 census and where he's still listed in Kelly's Directory of 1904. Day - Aldcroft. - January 12, at St. Martin's Church, Exning (by licence), by the Rev. Arthur Vaile, vicar, Mr Frederick W. Day, trainer, Newmarket, to Mrs Aldcroft, Lowther House, Newmarket. It was during this time that Fred's son Reg (more details below) started his career in horse-racing, when he was appointed head lad to his father. 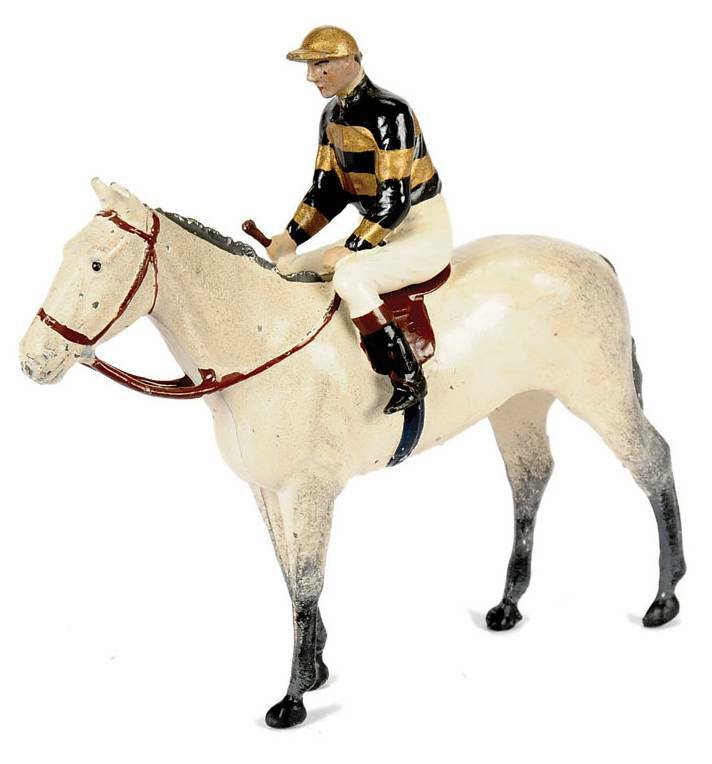 In 1900 he accompanied three horses from his father's stable to Ascot and they all won. Following this the Stewards of the Jockey Club granted Reg his licence to train at Newmarket and at the age of 17 he started at Terrace House as a fully-fledged trainer. On the 1911 census Fred, his family, including his son Reg and his new wife Jane had moved across the road to be here at Terrace House. By Kelly's 1916 Directory 'Frederick William Day, M.R.C.V.S., veterinary surgeon' was at Homebush on the Dullingham Road and his son Reg was the trainer at Terrace house. Frederick William Day died on 11th March 1919, leaving his estate to his son. The death is announced at Holmbush [sic], near Newmarket, of F.W. Day, a one time well-known trainer, in his 66th year. He is survived by two sons and three daughters. One of his sons is R. Day, the well-known Newmarket trainer. Day was a member of a family many of whom have been famous trainers and jockeys. He spent many years in Australia, where he was successful, not only as a trainer, but also as a veterinary surgeon. He returned to England in 1894, and had many good horses under his charge at Newmarket. He trained Airs and Graces when she won the Oaks in 1898, Georgic, winner of the Cambridgeshire of 1898, and Handicapper, winner of the Two Thousand Guineas in 1901. Airs and Graces became afterwards the dam of Jardy, a great French horse, who ran second to Cicero in the Derby of 1905, and was sold later for £30,000 to go to the Argentine. Day had been in ill-health for some time. The funeral will take place at Newmarket on Saturday. The interment of the late Mr F.W. Day, well-known in England and in Australasia as both a successful trainer of racehorse and a veterinary surgeon, took place at the Newmarket Cemetery on Saturday afternoon, the service being conducted by the Rev. J.H. Bannerman, Vicar of Newmarket All Saints. The principal mourners were as follow: - First carriage, Mr Reginald Day and Sergeant Alec Day, Royal Army Veterinary Corps (sons); second carriage, Messrs. Elijah Moore and Mr C. Heckford (sons-in-law); third carriage, Messrs. Tom Davis and J. Cartwright; fourth carriage, Mr Arthur Tupling and Mr F. Craven; fifth carriage, Messrs. A. Whitehead, S. Langley, and T. Bullman; sixth carriage, Mr J.H. Aylmer, solicitor (Messrs. Button and Aylmer). Others present included Messrs. J. Butters, Charles Waugh, J.A. Dawson, Captain J. Dawson, Dr. E. Crompton, Captain Ernest Tanner, Messrs. C. Foy, F.C. Paine, J.H. Moore, W.F. Smith, M.R.C.V.S., G.W. Kerry, M.R.C.V.S., W. Halsey, T. Bruckshaw, John Stubbings, D.T. Dickinson, John Hitchen, H.E. Walton, John Doyle, William Singleton, R. Spencer, George Craven, C. Jarrold, T. Thornton, T. Osborne, A. Challis, R. Steggles, F. Ongley (representing Mr James Hare), etc. The coffin, of panelled polished oak, with brass fittings, was inscribed: "Frederic William Day, died March 11th, 1919, aged 65 years." Messrs. F. Hammond and Son carried out the funeral arrangements. Lovely floral tributes bore the following inscriptions: - My darling. To our dearest dad, in ever-loving and affectionate remembrance, from Reg. and Floss. In ever-loving memory of my dear dad - Alec. To dear dad, with love from Flo and Elijah. In ever-loving memory of our darling dad - Eff and Jack. In ever-loving memory of our dad - Gert and Charlie. To our dearest granddad, with love from Wobby, Fred, and Bubbles. Dear granddad, with little Jack's love. To dear granddad, with love from Eileen, Iris, and Doreen. To dear granddad, with baby Alec's fondest love. With deep sorrow - Annie, Nonie, and Carloss. In affectionate remembrance, from Dolly and Claude. With deepest sympathy, from Lizzie, Joe, and family. In loving memory of a dear old friend, from Win. In affectionate remembrance, from Mr and Mrs T.W. Davis (Thornton Heath). With deepest sympathy, from F. Craven. With deepest, regret, from Samuel Langley, Albert Whitehead, Ellen Orbell, and Ida Fenn. With deepest sympathy, from Private T. Bullman. From Lady Edith Windham - in memory. With sincere condolences, from Mr and Mrs James Hare. With E.L. Heinemann's deepest sympathy (Hove). With deepest sympathy, from Mr and Mrs E.H. Leach. With deepest sympathy - Mr and Mrs Arthur Tupling. With deepest sympathy, Mr and Mrs Foy. From Mrs Lowman and nurse, with deepest sympathy. In affectionate remembrance, from Mr T. Bruckshaw, Dod, Nance, and Kez (Exning). With sincere sympathy and regret, from Mr and Mrs G.J. Ashby and family. With sincerest sympathy, from Mr and Mrs W. Dannan. In kind remembrance, from Mrs George P.T. Dawson (Cambridge). With sincere sympathy and deepest regret, from W.F. Smith and Jean Lye. From J.A. Dawson, in affectionate memory. With sincere sympathy, from Mr and Mrs Fox. With Mr M. Gurry's deepest sympathy. With sincere sympathy, from T.O. Watts. Jane moved to what became the Cartwright of Newmarket's family home at Avondale in Rous Road and died two years later on 31st August 1921. Day. August 31, at Avondale, Newmarket, Jane, relict of the late F.W. Day, aged 77 years. Death of Mrs Day. - We record with much regret the death of Mrs F.W. Day, who passed away on Wednesday night at Avondale, Rous Road, Newmarket, where she had of late been residing, at an advanced age. Mrs Day was first married to the late Mr Tom Aldcroft, one of the leading jockeys of his generation, who died many years ago. She was afterwards married to Mr F.W. Day, who also predeceased her. Mr Day will long be remembered as one of the cleverest and most successful trainers of his time. A veterinary surgeon by profession, he had gained much experience as a trainer before he came to Newmarket about 25 years ago. Starting with a filly which he picked up out of a selling race he very quickly began to win races, and soon had a big stable. Mrs Day was greatly respected and esteemed in the town, and her death will be lamented by a wide circle of friends. The remains of the late Mrs F.W. Day (widow of Mr F.W. 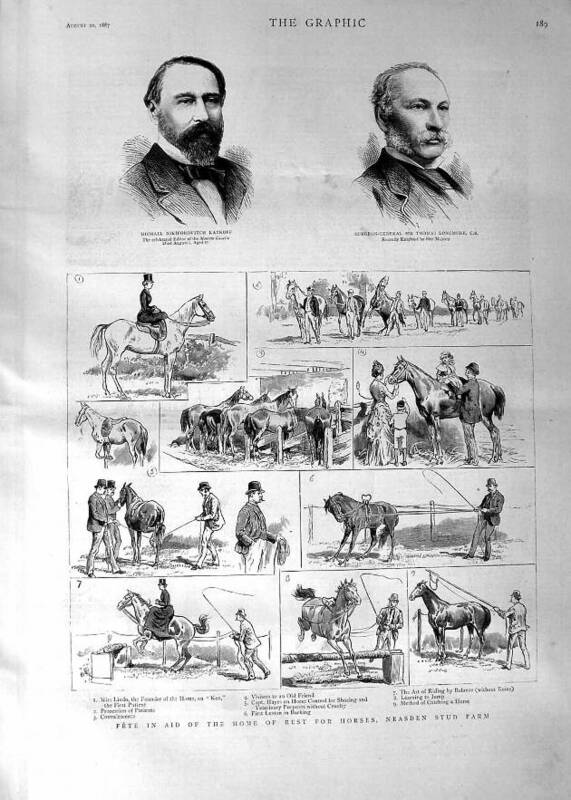 Day, trainer) were laid to rest on Monday afternoon in the grave in which her first husband, Mr Tom Aldcroft, the jockey and trainer, of Grafton House, Newmarket, were interred in 1883. The first part of the service was held in All Saints' Church, and was choral. Part of the choir was in attendance, and Mr James Edmondson presided at the organ. Canon Bannerman (vicar of All Saints') officiated. Prior to the service at the church the organist played "Consolation" (Bruce Steane) and "O rest in the lord." The service began with hymn 400, "Christ will gather in His own." The psalm was chanted, and hymn 27, "Abide with me," followed the lesson. The Nunc Dimittis was chanted as the cortege was leaving the church, and the organist afterwards played the Dead March in Saul. There was a large attendance at the church and cemetery. The principal mourners were Messrs. Reginald and Alec Day (stepsons), Mr J.A. Dawson and Mr J.H.T. Dawson (cousins), Mr J.D. Cartwright (nephew), Messrs. J.E. Watts, E. Moore and C. Heckford (sons-in-law of the late Mr Day), Mr J.H. Aylmer, of Messrs. Button & Aylmer, solicitors, Mr C. Ed. Hammond, J.P. a trustee under the deceased lady's will, and Mr and Mrs R. Spencer, caretakers at Avondale, where Mrs Day had resided. Mrs Reginald Day, Mrs T. Davis (her mother), Mrs J.D. Cartwright and Miss Jean Lye also attended the service at the church. Others present included Messrs. W.F. Smith, M.R.C.V.S., G.J. Ashby, H. Morgan, Jas. Bullock, C.R. Jennings, E. Leach, F. Craven, Mr and Mrs F.W. Cardy, Mrs John Smith, Miss Smith, Dr. C.F. Gray, Mrs Robert Lacey, Miss Crisswell, Miss Nicholson, Mr and Mrs A. Edwards, Messrs. T. Downes, H. Bilton, A. Heckford, Alfred Wright (an old employee), Mrs Langley (an old servant), &c. The coffin, of polished oak with brass fittings, was inscribed "Jane Day, died August 3rd, 1921, aged 77 years." Messrs. F. Hammond & Son carried out the funeral arrangements. Jno H Aylmer Solicitor Newmarket Clarence G Roe His Clerk. On the 2nd day of December 1921 Probate of this Will was granted to Joseph Dawson Cartwright and Charles Edward Hammond the executors. Many thanks to Geoffrey Woollard for all the above newspaper articles and Jane Day's Will. Reginald (Reg) Day was born on 20th February 1883 at Neasden Stud Farm, Neasden. After starting his career training at Terrace House in 1900, in late 1907 he was enticed to Germany to train for the Kaiser at the Royal Graditz Stud, where he had fantastic success. A few years later the time of the First World War was approaching and at the end of 1912 Reg returned to England to continue his training career back at Terrace House, where he stayed for the rest of his life. He married Florence May Davis on 30th November 1910 in Thornton Heath, Surrey. The marriage of Mr Reginald Day to Miss Florence May Davis, only daughter of the late Thos. Davis, of Queensberry, Thornton Heath, was solemnised on November 30th, at St. Saviour's Church, Thornton Heath, the officiating clergyman being the Rev. Harold King. Mr Day is the eldest son of Mr F.W. Day, trainer, of Terrace House, Newmarket, and has himself, young though he is, already won a very high reputation as a trainer, both in England and on the Continent. He gave up an important public training establishment in Newmarket some years ago, to become trainer to the German Emperor at the famous Graditz Stud - a position in which he succeeded Mr Richard Waugh. Under Mr Day's management the Graditz Stud has been most successfully carried on, and its fame has been fully maintained. Day - Davis. - At St. Saviour's, Croydon, by the Rev. Harold King, M.A., of St. Paul's, Thornton-heath, Reginald Day, eldest son of F.W. Day, of Terrace-house, Newmarket, to Florence May, only daughter of the late Thomas O'Connor and Fanny Davis, of Queensberry, Thornton-heath. 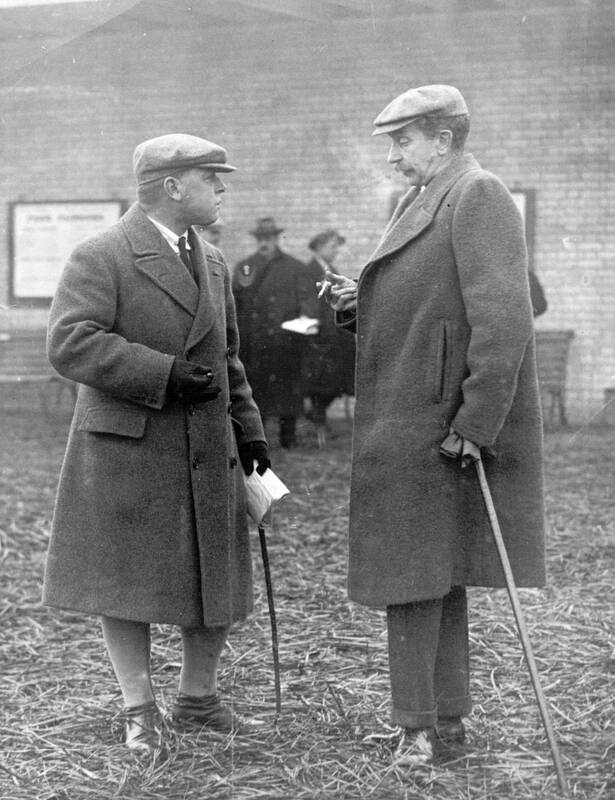 This photograph of Reg Day and the Earl of Sefton is thought to date from around 1920. During WWII Reg was Newmarket's own version of Captain Mainwaring (from Dad's Army) - as he was the platoon commander of the Home Guard. Reg's first wife Florence May died on 8th June 1949. He later re-married to Daisy Ethel Prince, daughter of Alfred Edward Prince & Emma Poole, in All Saints Church on 16th June 1951. Mr Reg Day, the Newmarket trainer, of Terrace House, celebrated his 80th birthday on Wednesday and entered his 63rd year as a trainer. Mr and Mrs Day are seen here admiring the cake which was a gift from their children. 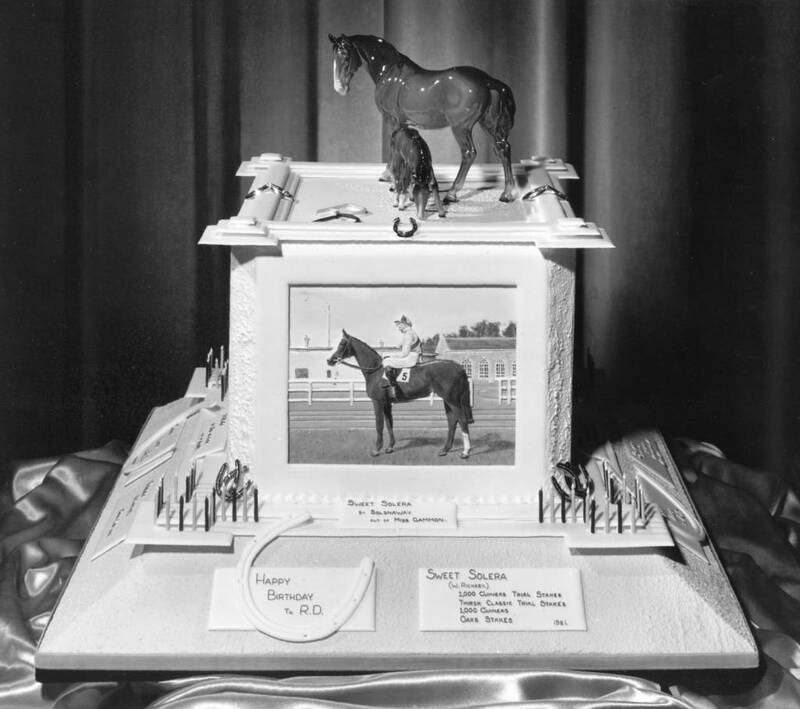 It weighs nearly a hundredweight and is in pale apricot icing with four sugar scenes depicting Classic winners he has trained They are Sweet Solera, Foxlaw, Son-in-Law and Solario. Training Career Started in 1900. St.Leger Day, 1900. Any record book will name the Classic winner of that year . . . But one thing it probably will not tell you is that the Turf gained one of its most outstanding personalities - Mr Reg Day, of Terrace House, Newmarket, who celebrated his 80th birthday on Wednesday, and entered his 63rd year as a trainer. And as is typical of the man he created a racing record the very second his trainer's licence was granted. At 17 he was the youngest, the most enthusiastic, and even he would probably admit, probably the greenest trainer in the country. But there have been many horses past the post since then. Today he is undoubtedly the most experienced trainer in the country - one would even go so far as to say the world. The only thing that remains from 1900 is his enthusiasm . . . that will never wane. At 80 he still rides out on the Heath with his string and if ever the day comes when he swaps the hack's saddle for an armchair, he will leave racing as he entered it - by creating a record. In fact if he retired tomorrow, and we stress he has no intention of doing so, he would have held a licence longer than any other trainer in the country. But setting records or a precedent is nothing new to Mr Reg Day. Looking back over his career of 63 years as a master of his craft is like looking at an almanack of the Turf. Just 12 years after being granted a trainer's licence he won more in prizemoney than any other trainer in the world. He trained Son-in-Law, one of the best stayers of all time, later to become the key sire in the pedigrees of top British bloodstock. The Roarin' Twenties will go down in history as the heyday of the big gamblers, but Reg Day outsmarted them all when Bracket won the Cesarewitch, one of the biggest gambles of the twenties. Sceptre, Pretty Polly, Donetta, Orient, Gulliver, Arnfield, Foxlaw, Solario, and Sweet Solera . . . some of the names that have made Reg Day the outstanding trainer he is. Arnfield, Gulliver and Orient all won the German Derby for him. He went to Germany in 1908 to take charge of the racing interest of the Royal Graditz Stud. Derby eludes him. But like many great trainers, jockeys and owners, the prize of prizes - the English Derby - has never come his way. His greatest disappointment must have been in the 1925 Derby. As they say in Newmarket, Reg Day's horse, Solario, was a moral. At the start Michael Beary hung back when a French horse broke the tape. He thought they would be recalled. But Steve Donoghue had sent Manna streaking away with the others. By the time Beary realised they were not being recalled he had 50 yards to make up. Solario finished fourth, but so fast was he making ground that a few yards past the post he was leading. Solario proved that he was the best horse in the country by trouncing Manna, the Derby winner, at Ascot. And later in the St. Leger he toyed with the field. But that is just one incident in thousands in the Reg Day story. To give a detailed list of his winners and disappointments would take months. And after all the final chapter in the story is far from completed. At 80 he is still as sprightly and alert as any yearling in his yard. Son-in-Law, amongst other horses trained by Reg, was owned by South African businessman Sir Abraham "Abe" Bailey (6th November 1864 - 10th August 1940). Bailey was one of Reg Day's principal owners and also a generous family friend. were black & gold hoops, gold cap. Reg retired in 1968 to manage the Hamilton Stud. He died on 15th January 1972 and is buried with Florence May in Newmarket cemetery. Mr Reg Day, doyen of Newmarket trainers and for some years in charge of the Imperial Graditz stud and stable in pre-war Germany, died on Saturday at his Newmarket home. He was 88. First granted a licence in 1900 he set up as a trainer the following year when only 18. He thus followed in the footsteps of his father who in 1898 had saddled Airs and Graces to win the Oaks and Georgic to win the Cambridgeshire Handicap. 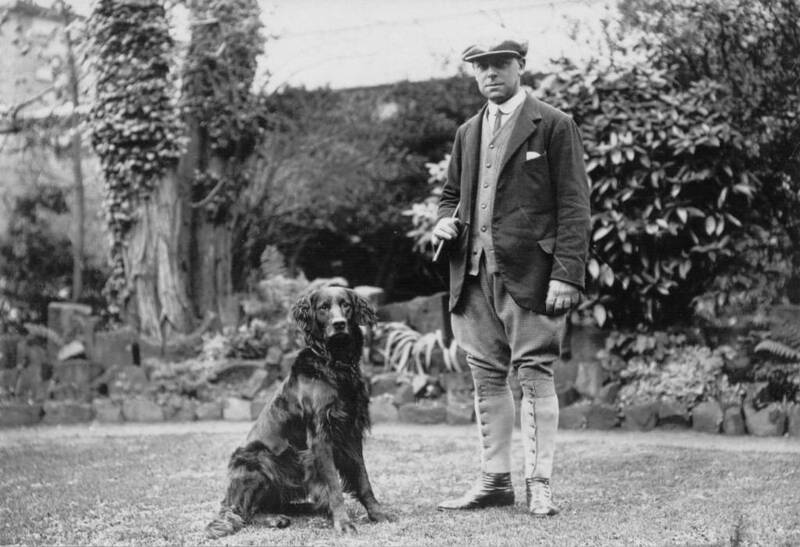 Since Mr Fred W. Day, a highly successful veterinary surgeon, had been given an official post in New South Wales it was in Australia that Reg Day spent his early years riding work on Randwick racecourse and learning about training routine with his father who by this time had added a stable to a big Sydney practice. In 1897 [sic] the family returned to England. Day had become private trainer to Sir Ernest Cassell and the 14-year-old was now his apprentice. It was not surprising that with this background and in this atmosphere Reg Day should have quickly made his name as a trainer; his cheerful optimism inspired confidence. Donetta won the Great Jubilee Handicap for him in 1906 and many other successes drew attention to his skill and judgment. All this led to the German invitation which he accepted and he took with him the top class Australian jockey Frank Bullock. Those years spent at the former Imperial Stud - now in the Soviet Zone - were both interesting and rewarding. He won three German Derbies with Anfried, Orient and St. Gulliver, he had successes in Austria and Belgium, but with the war clouds gathering over Europe he was back in Newmarket in 1912. Now he was training for the South African millionaire Sir Abe Bailey whose Son-in-Law won a Goodwood Cup and a Cesarewitch Stakes and later became champion sire in 1924 and 1930. He won the Ascot Gold Cup twice with Solario (1926) and Foxlaw (1927). 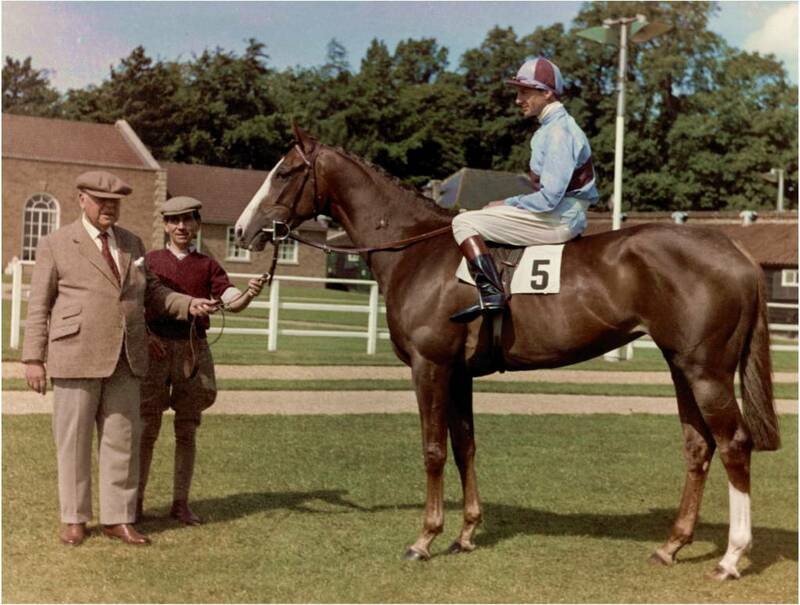 The former also took the St. Leger in 1925, while Sweet Solera won the One Thousand Guineas and the Oaks in 1961. His shrewdness was well shown when he gave 1,850 guineas for the last named on behalf of Mrs Castello, a London widow. Their purchase won six races in a row and nearly £40,000 in stake money. Other owners included: Sir Rex A.L. 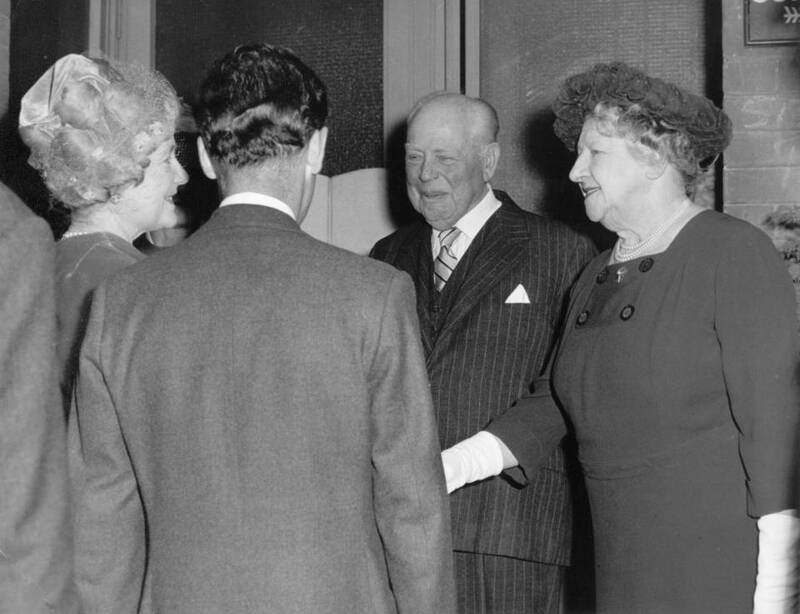 Cohen, Sir Malcolm McAlpine, Major General Glover, Mrs Day and their son Fred, a Fellow of the Royal College of Veterinary Surgeons and a former manager of Sir Charles Hyde's Jockey Club Paddocks. Apart from his long active live in training racehorses, Reg Day was interested in most forms of sport. On the business side he was owner of the Solario Stud and was closely associated with several others. He was always ready to advise and help. Newmarket without him will seem a strange and empty place. Horse Training 'Great' Dies at Newmarket. Mr Reg Day, who was the oldest horse trainer in Britain when he retired three years ago, died at his Newmarket home today. In a career that spanned over more than 70 years, he was regarded as the most successful trainer of distance runners this century. He would have been 89 next month. 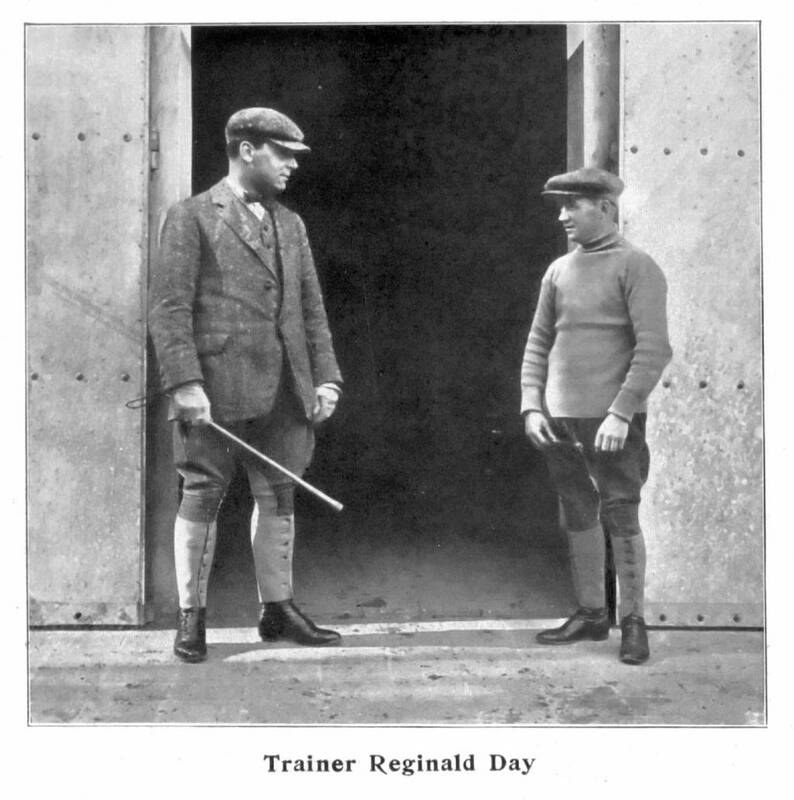 Mr Day first took out a trainer's licence in 1901 and his first appointment was as private trainer to Sir Edgar Vincent. He had outstanding success in association with jockey Bill Rickaby and the filly Sweet Solera, which won the 1,000 guineas and the Oaks in 1961. At one time, Mr Day trained in Germany for the Kaiser - and produced three winners of the German Derby. He officially retired in 1968 but retained his life-long association with racing through his work at the Hamilton Stud. Mr Day leaves a son, Mr F.T. Day, a Newmarket vet, and two married daughters. Reg Day Dies At 88. Reg Day, 88, whose training career spanned more than 60 years, died at his home, Terrace House, Newmarket, on Saturday after a short illness. He had retired from training in 1968. Day, a private trainer when only 17, saddled three German Derby winners in his early years. 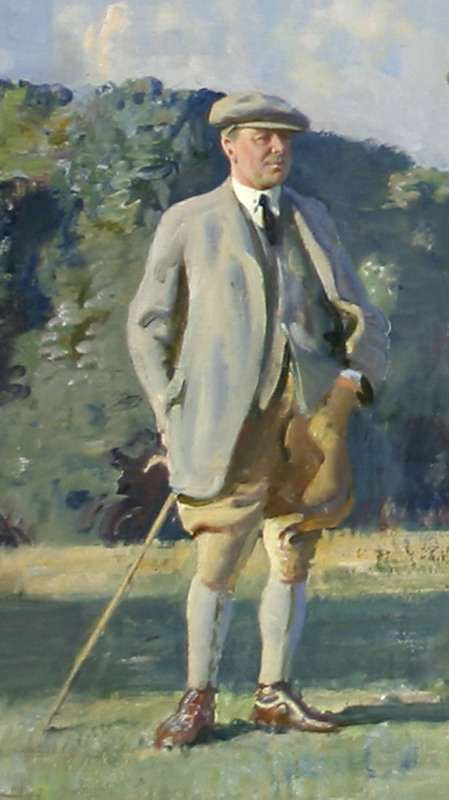 After a five-year spell in Germany he returned to England in 1912 to begin an association with the late Sir Abe Bailey which was to last for nearly 30 years. He trained Sir Abe Bailey's Son-in-Law to win the Goodwood Cup and Jockey Club Cup in 1914. That celebrated stayer won the Jockey Club Cup again in the following year, as well as the Cesarewitch. Classic successes for Day were with Solario, in the 1925 St Leger and Sweet Solera, in the 1,000 Guineas and Oaks of 1961. The funeral service will be held at All Saints Church, Newmarket, at noon on Thursday. Flowers may be sent to W.R. Southgate Ltd., Duchess Drive, Newmarket. The funeral of retired trainer Mr Reg Day will take place at All Saints' Church, Newmarket, at noon today (Thursday). He died at his home, Terrace House, on Saturday, aged 88. Mr Day retired just over three years ago after being a trainer for 68 years. His greatest successes included Son-in-Law, Solario, Foxlaw and Bracket, all trained in the years between the two wars. Mr Day and his family lived in Australia for a time where his father, Mr Fred W. Day, was veterinary adviser to the Governor-General of New South Wales. In his early teens he rode work in Australia. When he was 15 the family returned to England, bringing several Australian horses, including Georgic, which won the 1898 Cambridgeshire. Successes. He became a trainer in 1900 and while still in his teens became private trainer to Sir Edgar Vincent. In 1907 he went to Germany to train the Kaiser's horses - and he won the equivalent of £29,000 in prize money in his first season. His successes included three winners of the German Derby. He came back and set up in Newmarket. 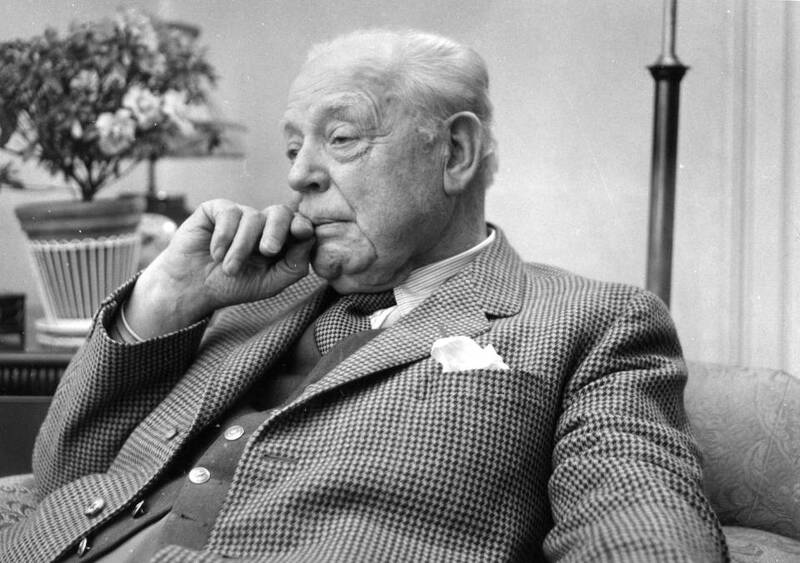 His chief patron was the late Sir Abe Bailey. 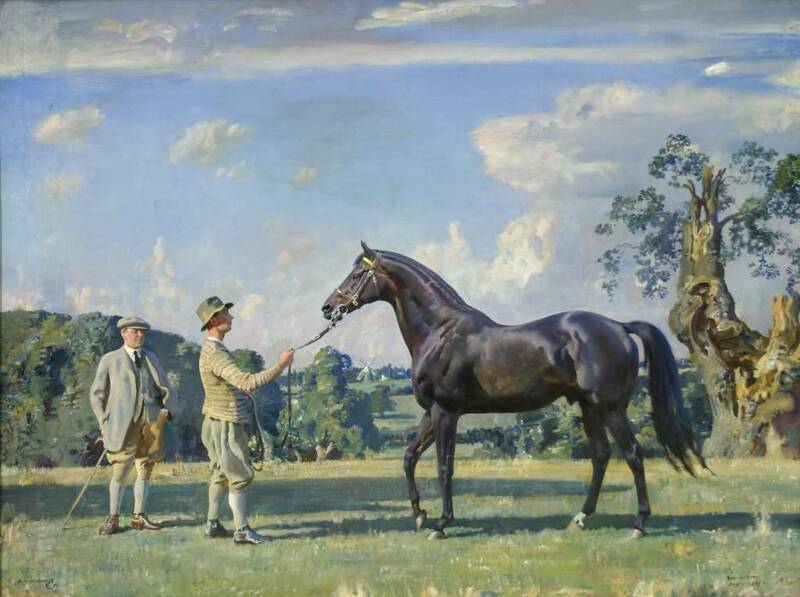 In 1914 he won the Goodwood Stakes with Collodian and the Goodwood Cup with Son-in-Law, the horse which went on to have such a tremendous influence on English breeding. Best Horse. Son-in-Law also won the Jockey Club Cup and the Cesarewitch. Mr Day also handled Solario in training and at stud, and said it was the best horse he had ever trained. He won the 1925 St. Leger, the 1926 Coronation Cup and Ascot Gold Cup. After Solario's St. Leger, Mr Day was some time before getting another classic winner. But in 1961, Sweet Solera won the Oaks and One Thousand Guineas. He retired from training in 1968 but continued to run the Hamilton Stud. He leaves a son, Mr F.T. Day, the Newmarket veterinary surgeon, and two married daughters. Many Pay Tribute To Famous Trainer. Representatives of racing and many local organisations were among those attending the funeral at Newmarket on Thursday of one of the country's best known racing personalities, Mr Reg Day. Mr Day, who was 88, began training in 1900 and retired in 1968 although he continued to run his Hamilton Stud. During his long and successful career he saddled such famous horses as Solario, Son-in-Law, Brackett and Sweet Solera. The funeral service was held at All Saints' Church, Newmarket. A very big thank you to Geoffrey Woollard for all the above photos, pictures and newspaper articles about his wife Sue's Grandfather - Reg Day. For those wanting to read more about Reg and before that his father Fred, click on the article 'The Reg Day Story' in the photos section below for a detailed newspaper report about them from 1959, once again provided by Geoffrey. Reg's success and influence in Newmarket and the horseracing industry is remembered in a race named after him - the Reg Day Memorial Handicap, now the Alzheimer's Research UK Handicap (In Memory Of Reg Day). Details about Reg's son Frederick Thomas Day can be found on the page for Bridlemere, he followed in his grandfather's footsteps in the veterinary profession. 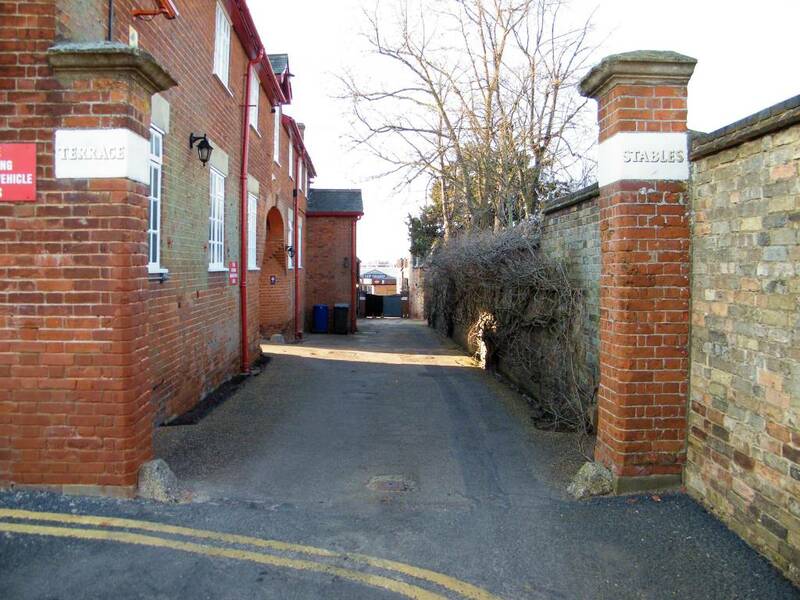 Terrace House Stables at Newmarket, where trainer Reg Day trained for 56 years, is up for sale. The property, including Terrace House, which fronts on to the High Street, has been in the Day family since 1899. Reg Day, who trained for a total of 68 years, took over the stables in 1912.